At Pindar Creative we pride ourselves in establishing strong, long-term relationships with our customers and helping them improve their communications with their own customers through print or via the internet. Originally part of Pindar plc and now a subsidiary of Halstan Holdings, we have developed a specialist service combining technology, experience and partnerships to maximise the effectiveness of publishing travel information across multi-channel domains. Our ‘total solution’ approach has been specifically designed to handle all aspects of publicity and internet requirements from design, data capture, conversion and management, typesetting, cartography, page make-up, online publishing, through to print production, storage and distribution. We are able to provide all these services from within our group, so when your deadlines are inflexible or you have very specific requirements, we can respond immediately and ensure your job runs smoothly. Our passion to design, create, gather, manage and produce content has set us apart from competitors for many years and, coupled with support from our highly-skilled and experienced employees, will continue to do so in the years to come. Need a Sustainable Travel Plan for your company/premises? All bus routes to/from Aylesbury call at the Bus Station in the centre of town, while many also call at the Railway Station and the High Street. Monday to Friday daytime every 60 minutes between Steeple Claydon and Aylesbury, with 2 journeys to Marsh Gibbon. Saturday daytime every 2 hours between Steeple Claydon and Aylesbury, with 2 journeys to Marsh Gibbon. Monday to Sunday daytime every 90 minutes to 2 hours. Monday to Friday daytime every 2 hours, evenings 1 return journey. Monday to Saturday daytime every 60-90 minutes. Sunday daytime every 1-2 hours. Monday to Saturday daytime every 20-30 minutes, evenings 30-45 minutes. Monday to Saturday daytime every 15-20 minutes, evenings 60 minutes. 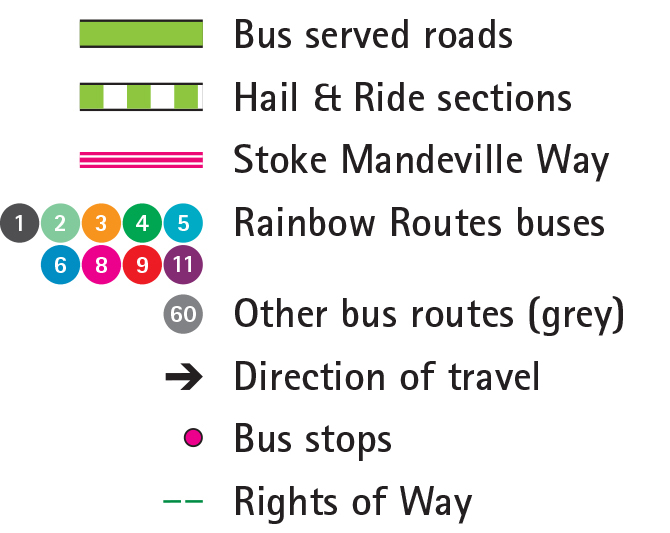 Rainbow Routes Network - the Rainbow Routes are a colour-coded network of buses operating on average every 15-20 minutes between Aylesbury town centre and the estates surrounding the town. silver rider 1 , route 2 , orangeroute 3 , greenroute 4 , route 5 , water rider 6 , Pinkroute 8 , Redroute 9 and route 11 . A frequent service operates between London Marylebone and Aylesbury Station, stopping at several locations along the way including Harrow-on-the Hill and Amersham. Approximate journey time is 65 minutes with some journeys continuing to Aylesbury Vale Parkway. Trains also operate to Princes Risborough where you can connect with services to/from High Wycombe, Bicester North and Birmingham. The Ruby cycle route is part of the Gemstone Cycle Network in Aylesbury and it passes along Gatehouse Road, near Alton House. Aylesbury Bus and Rail Stations - 0.8 miles (1.3 km), 17 minutes. Henley's Roundabout Bicester Road - 0.3 miles (0.5 km), 7 minutes. Aylesbury TA Centre Oxford Rd/Friarage Rd - 0.5 miles (0.8 km), 11 minutes. Walking is great exercise - good for the heart, reducing the risk of many diseases and an excellent way of losing or maintaining weight. Pindar Creative actively promotes sustainable modes of travel. If the only viable option is travel by car, we encourage car sharing to make journeys more environmentally-friendly. Parking spaces will be made available for customer visits.